A lot of small and family-owned businesses operate on a shoestring budget. For that reason, it’s not uncommon for them to be carrying a significant amount of debt. In fact, that’s one of the most common problems business owners bring to us at Cook Martin Poulson. They want to know how to reduce their debt. Carrying some business debt isn’t a bad thing. But, if the debt is weighing on your mind or preventing you from growing your business, you might need some help learning how to manage it. We can help. Here are some common-sense steps you can take to get your business debt under control. One of the things that can get small businesses into trouble with debt is not doing a good job of tracking their expenditures. That may be because sometimes, business owners think they can handle their accounting without help. Hiring a professional bookkeeper or accountant can make a huge difference in your bottom line. When purchases, payroll, and other expenses are tracked consistently, you’ll have a clear idea of how much money you have on hand – and you’ll know when something is beyond your reach. Once your accounting is up to date, the next step is to calculate your debt and figure out how much you owe. We recognize that this can be a scary step if you know the number’s going to be large, but it’s a must if you want to get your debt under control. It may be helpful to remember that you won’t have to pay all your debt at once. The key here is knowing what you owe so you can come up with a coherent (and manageable) plan to reduce your debt over time. Calculating your debt will also help you identify the oldest debt you’re carrying. In the business world, delinquency can cause your business credit rating to take a dive – and that can impact your ability to qualify for credit or financing. For that reason, we recommend starting by paying the oldest debt on your books first. The one exception might be if you have debt with an important supplier who’s withholding shipments until your debt is paid down. In that case, do what you need to do to keep your business operational – but don’t let that old debt fall off your radar. Pay it as soon as you can. You must work out a plan to pay off your debt, and you should start by talking to your creditors. Here are two things you might ask them to do to help you reduce your debt. Extend your payment terms. It may be a tough sell to ask a creditor to reduce your debt when you’re behind, but it’s worth a try. Explain your situation and tell them that extended terms would help you even out your cash flow. They might agree to 60 days instead of 30. Ask for a rapid pay discount. This one might be a big easier to request when you don’t have old debt, but again, it’s worth a try. Some companies are willing to provide a small discount (usually between 1% and 3%) if you pay their invoices in a specified time. For example, if their terms are Net 30, they might offer you a Net 30/2% Net 10, meaning that if you pay in 10 days you can take the discount. If you’re nervous about asking, remember that the worst thing they can say is “No,” and you’ll be no worse off than you are now if they do. Sometimes, business owners are uncomfortable making collection calls when accounts go past due. That’s a mistake because, like it or not, some of your customers won’t pay unless you push them. First, set up a schedule for following up. We recommend making an initial call when the invoice is due or within a few days of the due date. It’s a way of reminding the customer that they need to pay, and, in many cases, one phone call may be enough. Then, schedule regular follow-ups thereafter. Phone calls are often more effective than emails, which can easily be ignored. However, some clients may prefer email and you may get better responses if you use their preferred contact method. Finally, be prepared to cut off their supply or service if they don’t pay in a timely manner. It can be difficult to lower the hammer when someone reneges on their debts. That doesn’t mean you shouldn’t do it. It won’t help you reduce your debt if you’re sending good money after bad by continuing to ship to clients who aren’t paying you what they owe. As you begin to collect outstanding debts, you may also want to revisit the terms you extend to some of your customers. For example, you might want to shorten your terms across the board. Reducing the payment terms from Net 30 to Net 15 might help you improve your cash flow. In some cases, it may be worth incentivizing customers to pay more quickly. Just as you might want to ask your creditors for a rapid-pay discount, you may want to offer the same deal to your clients. A client who lags in payments may push your invoices to the front if you offer them an incentive to do so. On a related note, it’s also a good idea to look at what you’re charging. A lot of businesses stick with the same prices even when their expenses increase. There’s nothing wrong with raising your prices if you need to do it. When was the last time you did comparison shopping for supplies and raw materials? You might be able to get a better deal than you’re getting now. Do you have inventory you don’t need? Liquidating it might be an option – or discounting it to get it out of your warehouse. Either way, it can clear out space for products with higher margins. Is your office space just big enough? Or is it too big? There’s no point in paying for space that you’re not using, but a lot of business owners do it anyway. Sometimes they’re hedging against future growth but paying too much rent could be preventing that growth from happening. Anything that counts as an expense is worth examining for opportunities to cut costs. That doesn’t mean you must strip back to Spartan levels, but you might be surprised by how much you can save by doing this. The final thing you can do is to refinance some of the debt you’re carrying. If you own your building, you might see if your lender will work with you to provide a reduced interest rate. You might also consider consolidating debt into one loan. If your business has solid credit, this may be the easiest option. You can qualify for an affordable interest rate and reduce your monthly payments accordingly. Paying down your company’s debt makes sense. It will allow you to set up an emergency fund to handle unexpected expenses. It can also help you increase your cash flow, boost your credit, and ultimately, improve your company’s bottom line. 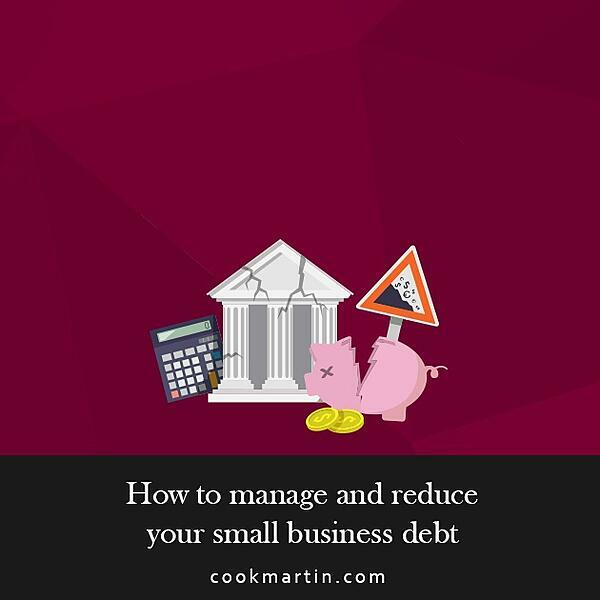 To learn how Cook Martin can help you get your business debt under control, check out our bookkeeping and payroll services.